Anyone who has a wardrobe made up of clothes in at least three different sizes has done the kind of closet cleaning and organizing I did Sunday night. Where I work, Friday is jeans day. Donate $1 to charity and wear a pair of jeans. As I had packed on weight the past two or three years, I was down to one pair of jeans that still fit. And they were too dirty to wear Friday. So Thursday night I went digging through the skinny clothes and found an old pair of jeans that actually fit again — and not too badly, I might add. For the past month or two, I’ve been way more careful about what, when and how I eat. I eat three meals a day and have stopped eating in between meals. I’ve also cut out soft drinks, candy and other junk. I am eating more slowly, eating real food and making sure I take 20 minutes to eat a meal. I weighed myself last week at the YMCA and it appears I have lost about 25 pounds since April. Wearing the smaller pair of jeans is even better proof than the scales. Learning I had some old clothes that may fit again spurred me Sunday to clean and organize my closet. I got rid of a bunch of stuff and pulled out a few shirts and pants to wear again that I had stored because they didn’t fit and now they do. 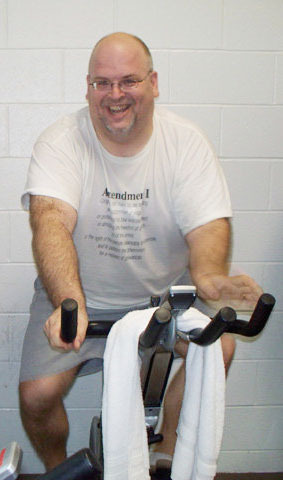 In other news on the health and fitness front, I’ve been hired to teach an indoor-cycling class at 12:30 p.m. on Sundays beginning on Nov. 7. Time will tell if this is a good or a bad thing, but friends are telling me I’ll be a good instructor. The good from it, in my opinion, is that I’ll now get a free membership to the YMCA and it is more incentive to keep working out and losing weight. And that’s good because the Y is going to start a weight-loss competition later this month that will run through March. Maybe I’ll lose more this time than the half pound I lost last year. Now – donate the fat clothes to Goodwill and vow never to go back! I am happy you are happy!!!! Non-scale victories are sometimes sweeter than scale victories!!! !